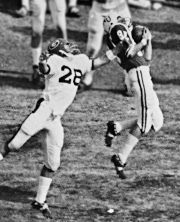 Staging one of the greatest kicking sprees of all time, Nebraska’s Paul Rogers literally kicked the Georgia Bulldogs out of the Sun Bowl as the Cornhuskers romped to a 45-6 victory before 31,728 sun-splashed fans. Nebraska dominated the game from the time almost all the 7,000 Husker boosters swarmed onto the field to welcome the Big Red before the opening kickoff. But it was Rogers who put the Bulldogs to sleep in dramatic fashion and then let his mates gallop at will. Rogers set a Nebraska and Big 8 record with four field goals in the first quarter, ranging from 50 down to 32 yards, a feat also good for a Big 8 and Nebraska game record and added to his season and career marks. Rogers got the Huskers rolling early when the first drive bogged down at the Georgia 33. His 50-yarder made it 3-0 and a Bulldog fumble enabled him to try again with 9:40 left, this time from 32 yards for a 6-0 margin. Van Brownson’s 45-yard pass to Guy Ingles set up a Jeff Kinney TD plunge and a 15-0 lead with 7:21 left in the quarter. 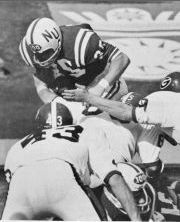 The victory, which evened Bob Devaney’s Nebraska bowl count to 3-3 and his lifetime mark to 4-3, capped a comeback 9-2 season that included the Big 8 co-championship.